IBC holds a very special place in my root beer reviewing life. It was probably the third that I ever tried, and could be found at the local Walmart in 6-packs of 12 oz bottles, 24-packs of 6 oz bottles, and single 32 oz bottles. My friends and I would snag the latter occasionally after bowling trips and buy the 24 packs for parties sometimes. It was also, during the great sadness in the summer of ’98, that taught me that all gourmet root beers are not created equal. At that time I was drinking several bottles of root beer a day to drown my sorrows. As IBC was much cheaper than the Henry’s I’d usually drink in such occasions, I started getting it as well to relieve the budget. Over the course of several weeks, I could clearly see that there was a difference between the two, and in this case you’d get what you paid for. It’s an okay root beer by my standards. Good Body and Head but too harsh and too much Bite for my taste. Aftertaste is okay. First off, I’ll admit that my reviews were significantly less detailed back in the day. I could go back and re-review it being more descriptive, but then I’d have to go back with all of them and that’d be a lot of work and some of them aren’t made anymore so I’m just going to keep it as is. You should feel blessed that you can read reviews from those early days and have a time capsule about how the web once was. Now there are some people who think that this is the greatest root beer ever made. I disagree. But it’s good enough for parties, or for the huge 32 oz bottle occasionally. See how it rates against other root beers. This last week I had the immense pleasure of traveling to Dhahran in the Kingdom of Saudi Arabia to do more electric car academic things, presentations and a thesis defense. I of course was on the look out for the greatest soft drink the world has and ever will known/know. I was simultaneously hopeful and worried. Hopeful, because all alcoholic beverages are banned and so many beer companies make 0.0% malt beverage to sell there, and worried because none of my Saudi friends have ever liked root beer. And also because the internet filter put on by the government blocked my site. I assume it is due to the “beer” in the title of Eric’s Gourmet Root Beer Site and all of the talking of root “beer”. I did send an unblock request explaining the misconception so hopefully it will be taken care of soon. Either way, it didn’t bode well for root beer finding. I searched in every grocery store and cafe I encountered, and while I did find many new and strange sodas and malt beverages, root beer eluded me until the second to last day. I had gone to Safeway in search of a post card (also something nigh impossible to find). 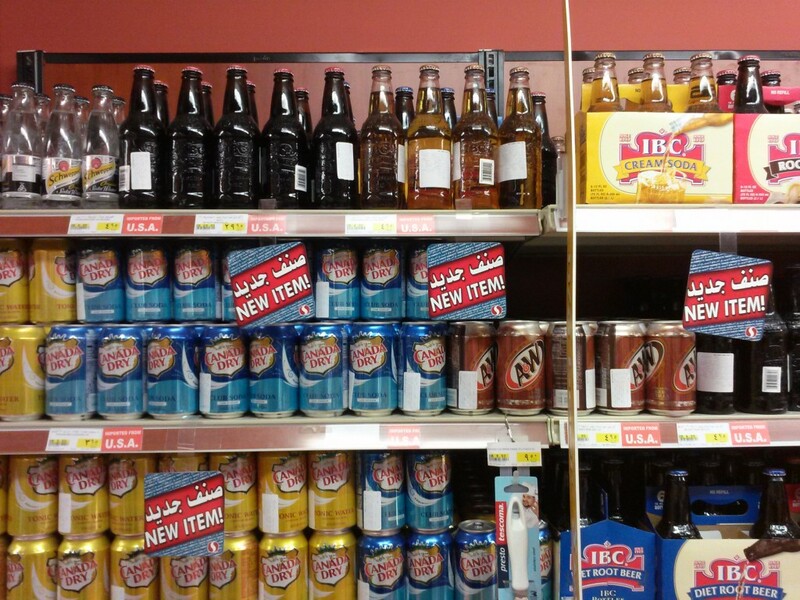 In the soda section I saw cans of imported A&W, my heart was swollen with joy, but not as much as when I turned the corner and saw another display with bottles of IBC. A drinkable gourmet root beer in a regular grocery store. A most triumphant win for the good people of the Kingdom this is. With any luck it will catch on and they’ll start making their own version for me to review. Until then, all root beer lovers heading out that way for extended periods of time can rest easy in the knowledge that some gourmet brew is awaiting.